In an anticipated great compromise, South Africa and Australia will share their sites for the Square Kilometre Array telescope, the world’s largest and most sensitive radio telescope. Both sites were competing to win the $2 billion contract for the SKA, which is hoped shed light on how the Universe began, why it is expanding and whether there is any other life beyond our planet. An SKA press release said the majority of the members were in favor of a dual-site implementation model for SKA. The members noted the report from the SKA Site Advisory Committee that both sites were well suited to hosting the SKA and that the report provided justification for the relative advantages and disadvantages of both locations, but that they identified Southern Africa as the preferred site. The members also received advice from the working group set up to look at dual site options. Therefore, the majority of SKA dishes in Phase 1 will be built in South Africa, combined with MeerKAT, a seven-dish prototype interferometer array built by South Africa, where 190 dishes will be added. 60 dishes will be added to the Australian Square Kilometre Array Pathfinder (ASKAP) array in Australia, as well as a large number of omni-directional dipole antennas. 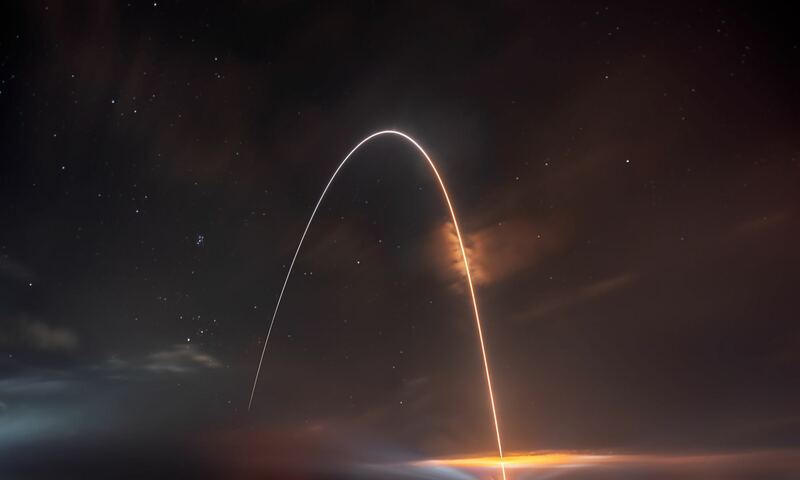 This will give the Australian site a wide-field survey capability, whereas South Africa will be able to look deeply into a narrow part of the sky. Three antenna types, high frequency dishes and mid and low frequency aperture arrays, will be used by the SKA to provide continuous frequency coverage from 70 MHz to 10 GHz. Combining the signals from all the antennas will create a telescope with a collecting area equivalent to a dish with an area of about one square kilometer. All the dishes and the mid frequency aperture arrays for Phase II of the SKA will be built in Southern Africa while the low frequency aperture array antennas for Phase I and II will be built in Australia. At the lowest frequencies, the SKA will be looking for red-shifted hydrogen, looking at the very earliest events of our Universe. At highest frequencies will look for things like pulsars or even pre-biotic molecules in space. The array will also be very effective in looking for transient events like supernovae or gamma ray bursts. One downside of splitting the frequencies between the two sites is that some of the science may suffer. One of the original science requirements of the SKA was to look at the same piece of the sky at the same time in different frequencies. Boyle said there is not much common sky between the two locations. Another is cost for having redundant computing and networking capabilities, not cheap for the remote areas where both sites are located. Womersley said that in this approach “Science is the winner,” and by building on existing pilot projects in both countries, the SKA will be made even more powerful. Additionally, technology is sure to get a boost, as the SKA project will drive technology development in antennas, data transport, software and computing, and power. Additionally, the SKA members say the influence of the SKA project extends beyond radio astronomy. “The design, construction and operation of the SKA have the potential to impact skills development, employment and economic growth in science, engineering and associated industries, not only in the host countries but in all partner countries,” said their press release. Can someone explain for an amateur why, if you have two sites, you don’t put one in the northern hemisphere? Additionally there are were traditionally fewer large telescopes in the southern hemisphere, leading to the sky there being less studied. That has slowly changed as Chile has become a dominant site for optical telescopes, but it’s still an issue in some wavelengths. Simple. The southern skies are better for astronomical observations rather than the poorer northern skies. Besides, the radio noise is across most of the northern hemisphere makes finding a site near impossible. The two sites will be detuned from each other so that the combined science is enhanced rather than diminished. It’s a win-win. ‘Dual site’…poor New Zealand. We don’t get mentioned much. Andy, our trans-Tasman cousins aren’t forgotten. What was described as the Australian bid is a joint ANZ proposal, and part of the scope will be built in NZ. Under this new arrangement, I don’t know how many antennae will actually be built in each place. The great advantage of the ANZ bid was the ability to achieve a very long baseline across two politically very stable countries. There must have been some concern that achieving the required baselines in Africa involved having antennae in 9 different countries. In this case is it proposed to have an interferometer with a ~ 2000km baseline? To get the phase velocity or wave front data properly defined it would make sense to have an ANZ-SA interferometer on a triangle. There is a little bit of course about getting precision timed signal across Antarctica though. Heh. With all the news of Craig Thompson, I don’t think this would even get a mention in prime time network news. It is great for Africa, the news will echo across the continent and make an excellent platform to promote astronomy into the most remote areas. When spiral galaxies collide, what happens to all of its planets and moons? Are elliptical galaxies devoid of planets and moons as well as star formation? What’s the difference between galactic cannibalism and galactic mergers? Specifically, what happens to the moons and planets of each galaxy in each scenario after the event takes place? If the Andromeda Galaxy does collide with our Milky Way, will our Solar System be ejected, and if so, will it hang in limbo for 100 million years while the 2 SMBHs fight it out? While our Solar System is in limbo, can another rogue galaxy come along, swoop us up and carry us away? We should focus some attention on the “Voids” in our galactic neighborhood, to see if our Milky Way Galaxy will one day occupy these empty slots which are created when clusters of galaxies pull other galaxies toward them, creating a “void” where it used to be. Are we drawn to the Shapely Cluster or to the Virgo Cluster? Or, does the pull of each one keep us centered–sandwiched between them? This would be ideal so that we don’t fall into EITHER of them…? “Contrary to the common assumption that it is gravity which is the ‘prime mover’ of the universe, the evidence is that it is actually electromagnetism, which is a vastly stronger force. There are four states of matter, the three you are familiar with (gas, liquid, and solid) and then another, which you see all the time and don’t recognize as what it is: plasma. A plasma is a gas with electrons stipped off the nuclei, usually because of intense heat. Our sun is a plasma. Stars are plasmas. We have plasma filaments strung through space. We have a plasma envelope around the earth (the ionosphere) and the auroras are plasmas.